Would You Rather Search And Buy Local? Smaller businesses are losing opportunities to connect with consumers. They need to compete more on quality and service if they cannot match the price of national brands. It could mean offering mobile services -- after all, half of consumers who perform a local search on a smartphone visit a store within a day, per Google. Local searches lead to more purchases than non-local searches. Google's study found that 18% of local searches on smartphones lead to a purchase within a day, versus 7% of non-local searches. So Yodle conducted a survey of 6,000 consumers about a variety of factors related to small and local businesses and found that consumers want to buy products and services from local businesses. Some 82% of consumers currently use local businesses and 48% plan to increase their use during the next year, compared with less than 1% of those who expect to decrease it. The majority of consumers find that local businesses outperform national chains on service and quality, with 96% suggesting that local businesses offer more personalized service. Some 75% of consumers go online to search for a business before they decide to buy from it or visit it in person. Even more than search, four in 10 consumers use online review sites or social media sites to look for a new business. Some 36% of consumers say reading reviews can give the business a competitive advantage, but only 7% have been asked to write a review of a local business even though 89% are willing to do so if they had a positive experience and were asked. Special offers for returning customers are the biggest differentiator for a local business, with 57% saying this sets the business apart. 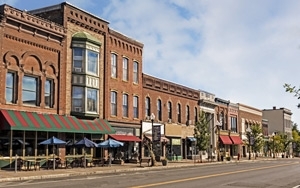 Consumers want more online communication from local businesses. When asked about communication tools like service and appointment reminders and advice or helpful tips, 84% and 80% want these features -- yet only 38% and 26%, respectively, of businesses do this. The survey suggests that consumers believe there's a significant gap exists between what they get from local businesses and what they want to receive. Many consumers are willing to pay for quality work from a local small business, although 77% believe that national chains offer more competitive pricing.